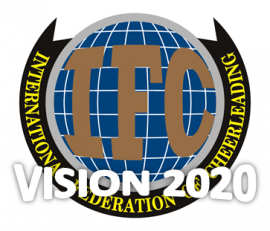 Following in the footsteps of the World DanceSport Federation’s “Vision 2012” and “2020 VISION”, the International Federation of Cheerleading assembled a working group which met in Singapore on the 2-3 August 2015 under the theme “IFC Vision 2020 Strategic Meeting”. The recommendations from the two days of broad-based discussions are expected to lay the foundation for the further development of IFC in a number of key areas including organisational structure, membership, integration with WDSF, education and competitions. “The IFC Vision 2020 Strategic Meeting presented IFC with a unique opportunity to build on the momentum generated by WDSF’s Vision 2012 and 2020 VISION and to make recommendations that are designed to have a positive impact on a wide range of stakeholders”. The recommendations will be presented to the IFC Executive Board for approval in the near future.